Home » How to Manifest » Are You Struggling to Use Feelings with The Secret? Answer: When your life is difficult and you desperately need things to change, it's hard to focus on being happy. Your focus is on the things you need to change and the things you want. It's normal to be filled with negative thoughts and worry. But you are so much stronger than you know. You can handle everything you're dealing with. You have the power to transform your life. It's as simple as shifting your vibration, even if it's just a little bit. The smallest shift produces change…and it makes it easier to make even more vibrational shifts. Don't try to jump from where you are now to happy. That's too far of a jump. Start smaller and work your way up to happiness. Make a list of the things you appreciate every day. Focus on your list whenever you have a chance or begin to lose hope. Feel gratitude for the water you use to take a shower. Feel gratitude for the clothes you wear. Feel gratitude for who you are and who you're going to be. Be patient. This process will take time. Some days you may feel like you've taken a step or two backwards. That's okay. Just pick up from where you are and refocus. Feel the gratitude. Try to feel love. Focus on feeling a little bit better…and a little bit better than that. Don't worry about losing confidence in things getting better. The Secret isn't about being perfect. You can't force yourself into that feeling place. Be patient with yourself. You can only do your best and that's good enough. Continue to feel gratitude for the things you have. This gratitude will bring you the things you want. 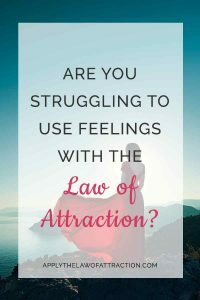 You don't need to worry about using your feelings with the Secret to attract them. They'll come to you naturally. It might happen slowly, but your life will change. Things will get better. So don't let other people or the events in your life bring you down. Let them do what they want, say what they say, play out how they want. Let them go. You have free will and can choose to believe that you are able to transform your life for the better. You can choose to feel gratitude and love. You can choose to shift your feelings a little bit higher. Manifesting: Where are You Now? I really enjoyed this. This seems to apply to overcoming deeply embedded resistance too. As you know from previous posts I have been working hard to overcome resistance. I too have had days where it seems to go backward. One thing I have learned is I have to be patient with myself. On bad days I have had to remind myself TRUST that no matter what I am going through, only the good things are being created. There isn’t any need to be perfect. Just do my best and trust because the Universe always see’s your progress and the fact that you are working to overcome. I had a bit of set back with fears, neg thoughts popping into the back of my mind. I was making great progress with ignoring them and had a day I got frustrated and impatient. Instead of ignoring, I tried too hard, focusing on it instead of finding a way to feel good. As a result it set me back a bit. I am committed to overcoming it though! And I trust that even while overcoming the last of it, only the good things are being created. Part of letting go. Thank you for all the guidance on your site. Your posts have helped me more than you could know and for that I am very grateful. Congratulations on the wonderful progress you’re making! You’ve gained a lot of great insight into how to make the Law of Attraction work for you. It’s normal to have setbacks like you mentioned. Just pick up and start moving forward again. As long as you keep going towards your goals, you are on the right path and will get there. It’s really just like riding a bike – when you fall off, you have to get back on again. Also, thank you for the kind words. They came at a time when I really needed to hear them. Best wishes in everything! I was wondering something. Before I knew what the LOA was, I manifested my soulmate to me in a wonderful relationship. This was a few years ago. Then I went through that resistance. Due to that things became hot/cold in our relationship. As I have continued to overcome the resistance, I have been seeing very happy changes within our relationship. I am very grateful for that! I definitely want things to continue to get better, better than before, etc. I know with LOA it is ASK, BELIEVE, RECEIVE. Based on what I went through with resistance and overcoming it, would it be a good idea to sit down and write out what I want with him? I know it is like placing an order and the original order was placed a few years ago. Things were on track up until I went through what I did. Thus I was wondering if I should write it out since I got off track for awhile? It wouldn’t hurt. It might help you to get clear on what you want again. You’ve also changed since then so some of things on your original list may have changed to. I wanted to share something with you. Over the past day or so I have been seeing a big and happy shift within my thoughts. Suddenly the stuff I was letting go of isnt a big deal. Instead of feeling scared its like the back of my mind is shifting to only the good things are being created background junk can’t hurt me. Get this Elizabeth as that has been happening I am also seeing happy changes within my relationship. Is this part of letting go?